Authorities are looking for a gunman on a community college campus in North Carolina after one person was fatally shot Monday morning. 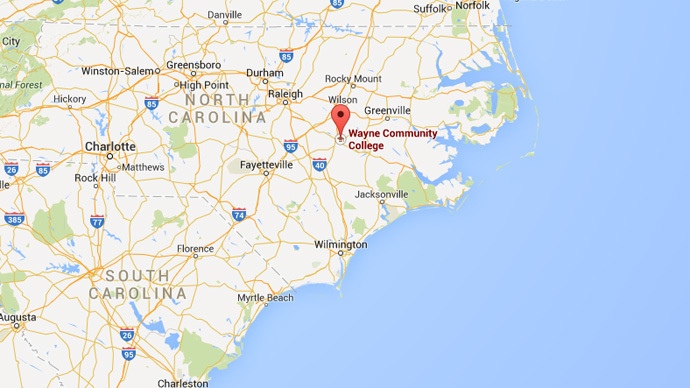 Wayne Community College in Goldsboro, NC was on lockdown after one person was shot in the school’s library, Daniel Wiggins, the assistant operations manager for Wayne County, told CNN on Monday. According to the Associated Press, an emergency call was placed at around 8 a.m. ET on Monday concerning an active gunman on campus. WRAL News reported that the suspect was seen carrying a long rifle, and authorities have yet to officially release any details concerning the weapon. The library shooting victim has since died, City Manager Scott Stevens confirmed. Authorities put out a bulletin shortly after the searching for a bald, white male with a tattoo over his left eye, and later identified their suspect as Kenneth Morgan Stancil III, a 30-year-old former student. Police were still searching for Stancil eight hours after the Monday morning shooting, but said the campus would open as usual on Tuesday, albeit with extra security.